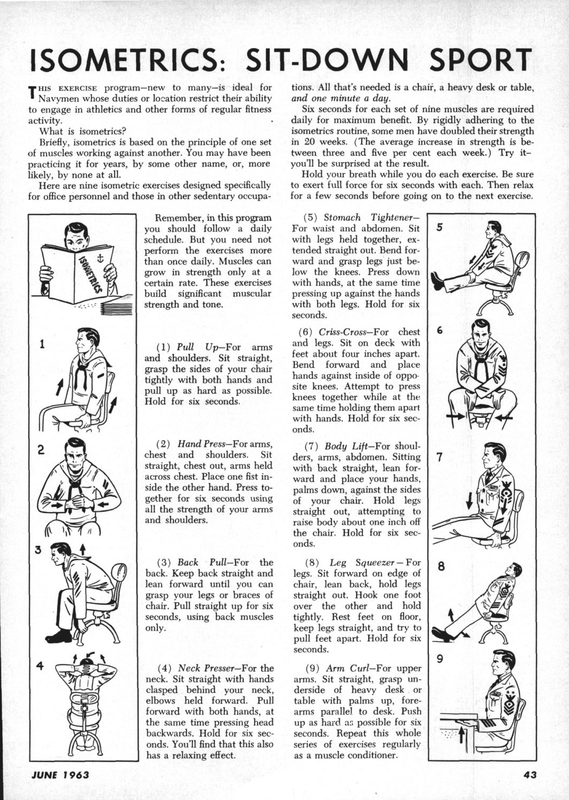 Turn your desk into a fitness center with these tips from a June 1963 All Hands magazine. Shore duty means more time with your family, sure, but it can also mean more time on your rear end. Health researchers have been publishing study after study lately on the health dangers of sitting at a desk all day, but fear not! There’s a workout you can do while you’re answering emails — and it’s 51 years old. All Hands magazine published a nine-step fitness routine for sailors to complete at their desk, which is demonstrated in illustrations by a recruit, apprentice, seaman, petty officer 1st class, petty officer 2nd class and a master chief. Hat tip to TIME magazine, which used this as a basis for an illustration and article in its Jan. 31, 1964 issue, which the magazine pulled out of its archives Wednesday. The symptoms are turning up everywhere,” TIME wrote, in the Jan. 31, 1964, issue. “A commuter puts down his paper and his eyes glaze as if with some interior rapture; a stenographer stops typing and stiffens in her chair; waiting for the children’s hamburgers to brown, a housewife suddenly presses her hands on the kitchen table until the knuckles show white. These are not the victims of some new virus, nor has the strain of modern living sent them around the bend. Instead, they are practicing the very latest wrinkle in body culture: isometrics. There’s no advice on what to do if your boss starts looking at you sideways, though.